Team Canada is playing host to this week’s 4 Nations Cup in Saskatoon, Sask. 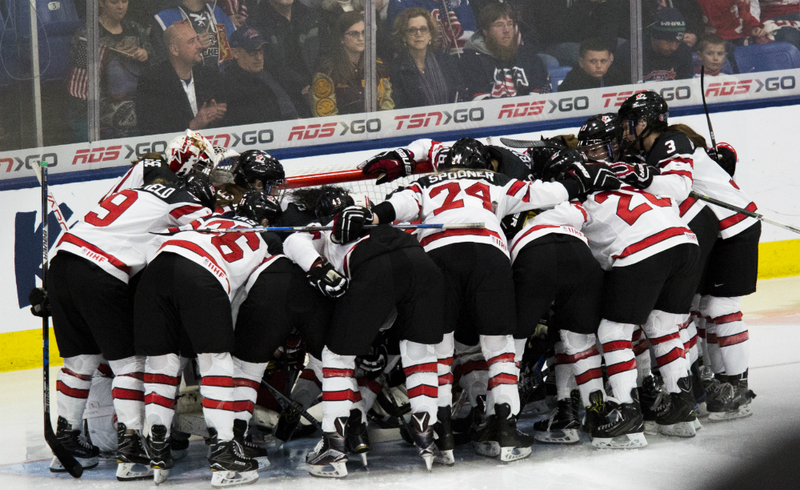 Canada has never lost a 4 Nations Cup gold medal when playing on home soil, and that’s a trend the team would like to see continue, particularly this year. It’s been exactly four years since the Canadians won gold at any major senior-level tournament in women’s hockey. This will be the first tournament for new head coach Perry Pearn. He was an assistant coach for Team Canada at the Olympics in Pyeongchang, but he wasn’t technically named as such until January 30, just a few weeks before the Olympics began. Here’s a breakdown of the Canadian roster for the 4 Nations Cup, by position. Canada’s forward group features significant depth, but it’s safe to expect Marie-Philip Poulin, Rebecca Johnston, Natalie Spooner, Brianne Jenner, and Mélodie Daoust to lead the way up front. Poulin has led the conversation of “best player in the world” for a long time now, and she’s Canada’s leader in all situations. Johnston, Spooner, and Jenner have all proven they can contribute at an elite level as well. Daoust was the MVP of the 2018 Olympics, and she really showed last year how much skill she brings. She’s an offensive presence for Canada in every game. Jillian Saulnier is already a good top-nine forward for the national team, and I expect there’s another level she can get to for Team Canada. She brings a lot of energy to the offense, and after six games with Les Canadiennes, she’s leading the CWHL in scoring with eight points (three goals, five assists). Sarah Nurse, Blayre Turnbull, and Laura Stacey were all solid in lower-line roles for Team Canada at the Olympics. Turnbull and Stacey are capable of contributing on both sides of the puck, though they can step up their offensive game, too; both players have six points in six games with their CWHL teams. I think Nurse’s game is more suited for a true top-six/offensive role, so we’ll see if she gets those minutes and how much she contributes in this tournament. As is usually the trend early on in a new Olympic cycle, there are a number of new faces who are getting a look with Canada, and it’ll be interesting to see what kinds of roles they play in the line-up. Sarah Fillier is the youngest player on the roster, but she’s been very good already as a freshman at Princeton. It’s a small sample size, but she has eight points in four games for the Tigers. Loren Gabel will also get her first action with the senior team. She’s been a highly productive player at Clarkson, scoring 36 goals and 39 assists for 75 points in 41 games as a junior. She’s currently second in the country with 19 points (seven goals, 12 assists) in nine games. Emily Clark, who won silver with Canada in Pyeongchang, and Sarah Potomak were originally on the 4 Nations roster, but are unable to play at the tournament due to injury. They’ve been replaced by forwards Jamie Lee Rattray and Kristin O’Neill. Rattray has done nothing but play at an MVP-level for her club and college teams, but she’s never quite settled in for Team Canada. This is a good opportunity for her to show she can play at a high level under a new coach. O’Neill is another one of those new faces. She’s (pretty quietly) been an excellent player for Cornell in all situations, and while she’s a particularly dominant defensive forward, she’s got the skill to score as well. Victoria Bach, a rookie with Markham in the CWHL, was another late addition to the roster, though Hockey Canada hasn’t announced any other cuts in her place. She’s one of the best goal-scoring talents we’ve seen in the NCAA recently; she put up 39 goals with Boston University as a senior last year. There’s definitely potential for those skills to translate at this level, but as a late add, we probably won’t see her in a featured role this tournament. There’s been quite a bit of turnover on the blue line for this tournament, which was a bit expected. Canada took only six D to Pyeongchang and of that group, Laura Fortino, Jocelyne Larocque, and Renata Fast are returning. Meaghan Mikkelson is taking time off, and Brigette Lacquette and Lauriane Rougeau appear to be out of the mix for right now. Halli Krzyzaniak and Micah Zandee-Hart are back in the fold, and Katelyn Gosling and Jaime Bourbonnais are getting looks as well. Fortino is the team’s clear No. 1 defender, and Larocque can be expected to shoulder a hefty load at 4 Nations. Both were relied on heavily at the 2018 Olympics. Fast, who was very good in college at Clarkson, has upped her game further the last few seasons since joining the CWHL, showing she can play with pace, and I think there’s a fairly high ceiling for her with the national team. Though Krzyzaniak was left off the Olympic roster, she’s a four-year veteran of the national women’s team and has played tough minutes for every team she’s been on, thanks in large part to smart play-making and strong defensive play. Zandee-Hart was also centralized last year and she’s shown a good amount of potential as a two-way defender. I think she’ll have a good chance at this tournament to show she can make plays in a top-four spot. Gosling has been with the CWHL’s Inferno since 2016-17, and she’s done well in the professional ranks. She was Calgary’s highest-scoring D last year with seven goals, 11 assists, and 18 points. This will be her first action for Team Canada since the 2017 Nations Cup with the Development Team, so she’ll be a player to watch as she makes the jump to the highest international level. Bourbonnais rounds out Canada’s defensive corps. She stepped up in a big way for Cornell last year with Zandee-Hart centralized with Canada, and one would imagine she had a strong fall camp in order to make this roster. Bourbonnais has shown good offensive instincts, and I think if she can play well in transition, she’ll be a valuable player for Canada moving forward. Long-time starter Shannon Szabados is back for Canada. She’s already proven to be one of the best in the world, and she gives the team a great chance to win whenever she plays. The other two goalies on this roster offer up a bit more interest. Emerance Maschmeyer already has a lot of experience with the national team, but she wasn’t centralized last season ahead of the Olympics (though she did spend time with the team due to injuries). She’s shown time and time again she’s fully capable of standing on her head, and she was outstanding at the 2016 IIHF Women’s World Championships. This will be Shea Tiley’s first action with Canada’s senior team. Last season, she concluded a fantastic career at Clarkson, winning back-to-back national championships and setting plenty of school records along the way.